Akira Kurosawa built a legendary catalogue of great films, and a large portion of it comes from inspiration from outside sources. His takes on Shakespeare, Throne of Blood (Kumonosu-jô) and Ran, waltz along the lines of faithful adaptation and inventive deviation to a supreme degree, as does his look at Dostoevsky's The Idiot (Hakuchi). Perhaps his most fond take on an established source is Yojimbo, the piece of work he wrote and directed as something of an homage to the classic western. He creates an environment that's pitch dark with its comedic aims and savage in its depiction of citizens at odds, existing as a furiously engaging -- and, at times, mentally stimulating -- portrait of a sword for hire playing a dusty one-horse town like a chessboard. That sword for hire is Sanjuro, played by Kurosawa regular Toshirô Mifune, who's a gruff and sturdily-built ronin that recently tread into an emaciated town in the middle of a civil war. Two rivaling criminal outfits, one being a reluctant yet conniving group that focuses on silk and a brothel and another being a wilder ragtag group that focuses on sake, are slowly chopping down each other's brothers in a fit of chaos throwing the town's neutral parties in a panic. Sanjuro, after given early advice that the fighting gangs might require his "services" as a bodyguard, keeps his cool and watches the activity bustle around from a seat in a semi open-aired sake house. One person says he should leave town completely, while another tells him to chop the arm off one of the rival gang members; the samurai, however, waits for the right moment before he does anything, then orchestrates a boom that both ups his value and the body count. 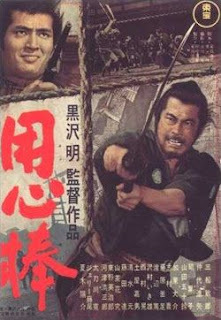 Kurosawa begins to play with a macabre spin on supply and demand as Sanjuro's time in the town extends, creating a clever back-and-forth between the gangs' leaders where the samurai maneuvers around them so that his potential salary swells. What's smart about Kurosawa's direction -- and writing -- is the way that a stream of bleak humor builds around the gang's desire to purchase Sanjuro's services not to be victorious, but more scrambling to save their own hides from meeting his sword. Typically animated and well-drawn caricatures are built in the two groups' midst, including a bloated but dangerous buck-toothed samurai and a tall, menacing henchman to a far shorter boss. Seeing them scramble and sweat under Sanjuro's thumb can be supremely humorous -- especially when he boils tempers to a point where all-out war between shaky-sworded henchmen looks like it's going to break out at "high noon". Yojimbo's desolate environment is captured through the eye of cinematographer Kazuo Miyagawa, who also shot other Kurosawa films and Kenji Mizoguchi's breathtaking ghost story, Ugetsu Monogatari. Rays of his familiar talent can be seen through soggy rain-drenched sequences in the village, reflecting on the persistent rain in Rashômon, while the dense, linear scenic shots and cool close-ups within Sanjuro's little base of operations in the sake house reflect a similarity to Mizoguchi's film. Since his film relies heavily on the dialogue creating a brash yet humorous atmosphere, Kurosawa allows for the visuals to speak for themselves in capturing the emptiness and desperation within the town. It makes for a visually breathtaking picture as Sanjuro trumps through the hazy streets, taking us by businesses and homes deteriorated by the warfare -- aside from the coffin maker, whose work spikes during the gangs' quarrel. It's hard to find a Toshirô Mifune performance in a Kurosawa samurai film where he's not a wild-eyed lunatic, but that's just the case with Yojimbo. He's in his element when insanity's taking over, from his iconic turns in The Seven Samurai and Rashômon to a personal favorite performance as the mentally-collapsing Washizu in Throne of Blood. As Sanjuro, however, he's given a starkly different direction; he isn't wild, but he is unabashed in his tactics. 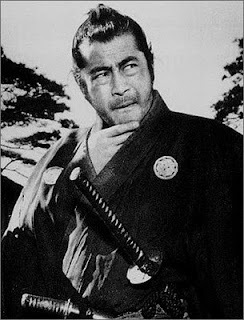 Mifune carries him with a methodical, deep gaze, lumbering his slightly twitchy self between clan houses with purpose. It's his signature grin that gives away a bit of that sly madness present in his other performances, seen as he stands atop a watchtower during the gang's stilted brawl near the end of the first act. As he minces words and reticently slithers around each leader with a scowl and a bloodthirsty glint in his eyes, our enthrallment mixes with a desire to grin at his scheming -- and in the scant, aptly-handled sequences where he actually draws his blade. Along with that, some of Mifune's strongest dramatic sequences are with legendary character actor Takashi Shimura, who plays the sake house head Tokuemon and Sanjuro's confidant (and our ears) for his scheming. Another of Kurosawa's regular actors, Tatsuya Nakadai, eventually arrives into the dusty village as Unosuke, son to one of the crime bosses and a pivotal -- and thought-provoking -- addition to Yojimbo. He looks to be a composed individual who might threaten Sanjuro in the arena of swordplay, up until the point where he draws a revolver. With the revelation of the firearm, the dynamic between the warring gangs completely changes, creating an environment where the otherwise invincible Sanjuro can be killed from a distance. Kurosawa never explicitly addresses the potency of the firearm's presence in the dialogue; instead, he utilizes his characters' mannerisms and the dramatic dominoes collapsing around Sanjuro to emphasize the gun's importance. Along with the gun's cunning presence giving us a plot revelation, a sense of fear and respect for its destructive power becomes a central, bleak element, recognizing it as a great equalizer while Unosuke presents it as a tool of eminence that's barely bridled within his grasp. What's great about Yojimbo is the way Kurosawa brings together these elements, from visual mood and a defining performance from Mifune to the thought behind violence-based mercantilism and game-changing weaponry, into a picture that by and large exists as a form of barefaced, vivid entertainment. It doesn't exist with much message lying underneath the chaos ensuing around Sanjuro, but more to keep a sadistic grin on our faces as we watch the stern for-hire ronin pit the lower minds of the gangs against one another. With this role, Kurosawa also indirectly established the concept of a "man with no name", a role later adapted by Sergio Leone for his Clint Eastwood collaboration, A Fistful of Dollars. It's interesting that a film created as a violent, samurai-infused love letter to the classic western would, in turn, spark another famous next-generation series of westerns. That's just how finely-tuned and compelling the framework of Sanjuro's character can be, a perfect fit under Kurosawa's direction.